Never was there a more vital time for the film industry than the Second World War; all around the globe, from Nazi Germany to the shores of Britain, propaganda films were being made to boost morale or reinforce people’s fears and hatred of things (the latter being especially true for Joseph Goebbels’ unfortunate line of work). 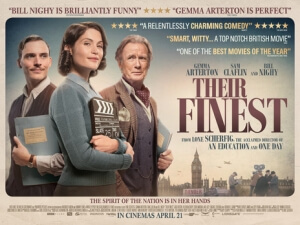 But luckily, Their Finest is not about Goebbels’ career as the leading Nazi propagandist, but instead focuses on how the British used their strongest creative minds to inspire and embolden its citizens with grand, moving tales of courage and heroism, appropriately in a film that is itself, for the most part, a grand and moving tale of courage and heroism, all of it behind a typewriter. That typewriter belongs to our central character Catrin Cole (Gemma Arterton), a Welsh copywriter who is recruited by the film division at the Ministry of Information to write the “slop” – women’s dialogue – for jaded scriptwriter Tom Buckley (Sam Claflin). Catrin soon comes across a real-life story of two sisters who stole their uncle’s boat to head over to Dunkirk, and uses it as inspiration for a film she convinces her superiors to make. Soon, writing and production gets underway, including the hiring of serious thespian Ambrose Hilliard (Bill Nighy) to play the comedic part of the uncle, and Catrin tries to balance her new busy schedule with her other priorities, with mixed results. The most fascinating aspects of Their Finest are when it actually focuses on the development of the film within the film, including the script that the main characters are writing. As someone who studied screenwriting for their university course, I immediately recognised traits and tricks used by Arterton, Claflin et al as they’re coming up with plot points, such as pinning beginning and ending beats onto a wall and filling in the gaps, and receiving instructions like removing half of the dialogue to make it more fluid and less long-winded. It’s fun seeing these creative minds bouncing off one another, and Arterton and Claflin have decent enough chemistry in scenes that have them rely fully on their desire to see effective dramatics on the big screen, making you really want to see their vision come to life in the best possible way. Everything involving the actual production is fun to watch too, as it ranges from screwball scenarios such as the forced hiring of an American war hero (Jake Lacy) with absolutely no acting chops whatsoever, to intimate representations of location shooting, watching the dailies, and creating entire sets in a studio. It’s an ode to an era of filmmaking that has long since departed, and any film lover is bound to get a kick out of seeing it in action one more time in a significant film such as this. The rest of the film is very much of the crowd-pleasing variety, and it does a good enough job of that as well as not shying away from some of the real atrocities that came with war-time London. You get scenes of bomb raids destroying houses and buildings, and claiming the lives of so many people, sometimes even people we’ve come to like, but when the lighter elements come into play it’s not so jarring of a tonal shift, and it comes as light relief after those darker moments. It gets the laughs that it needs to get from its audience, and its passion towards its subject matter is so strong that it carries the film right up towards its bittersweet ending. The actors bring their all to their simplistic but likable roles, with Arterton just about coping with her Welsh accent to deliver a heartfelt lead performance, and Nighy stealing every other scene he’s in as arguably the film’s comedic highlight (although Nighy is just about good in anything he does, even the more rubbish ones). Though it threatens to fall apart near the end, mostly due to one sudden bit of character development that’s literally out of nowhere and feels like a cheap bit of manipulation, Their Finest is a serviceable and enjoyable comedy-drama about an era of filmmaking where it could be argued that, more so than any other time in the 20th century, the power of film was more important than ever. Their Finest is an enjoyable ode to war-time filmmaking, injecting enough light comedy and sustainable drama into a fascinating story with simple but likable characters, which for the most part enables it to succeed as a fine bit of period comedy-drama.